hospital, which provide a perfect environment in which you may "practice what you are learning. The CD-ROM uses streaming videos to represent patients just as you would see them in a hospital setting and gives you access to highly detailed patient records - including charts, medication administration records, a Kardex-type plan of care, a drug guide, and an extensive electronic patient record system that has data for each client from the time of their admission throughout their simulation.Promotes active learning as you collect information and process data for evidence-based patient care.Includes 10 unique patients/cases, each with complex medical conditions. Allows you to monitor and care for one or more patients during four, 45-minute periods of care within a 12-hour shift. 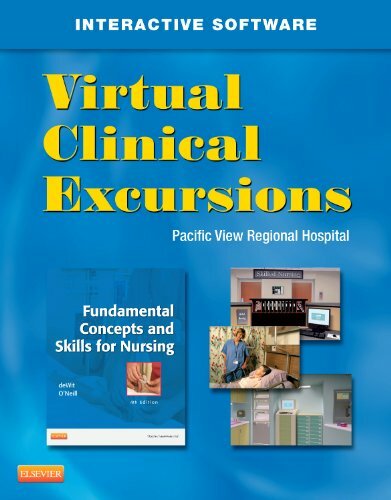 Workbook lessons complement the content of the textbook and link reading assignments with patients in the virtual hospital. Online workbook lessons allow you to complete assignments online. Exposes you to realistic information resources, such as the EPR, MAR, and patient charts, to prepare you for managing data and decision-making on the floor. A Medication Room contains a wide variety of drug storage areas. A medication administration function allows you to select, prepare, and administer medications. Contains over 55 common medication errors embedded within the software to boost clinical realism and reinforce the precepts of safe medication administration in a harm-free environment. Includes a Drug Guide with drug monographs for all medications used within the program. Fully integrates psychosocial aspects of nursing through nurse-client interaction videos that underscore the psychosocial component of patient care. Clinical Alerts highlight major changes in each patient's condition. An Online Testing Program with over 250 NCLEX® exam-style questions on each patient/case allows you to measure your understanding of the content and access your relevant clinical judgment.